A group explorers were making a documentary for National Geographic in Scotland about the Loch Ness Monster, and one night while sitting by the campfire, they concocted a dream to go and find the Titanic. This seemed like an impossible dream at the time as many people and organizations had tried and failed until then. 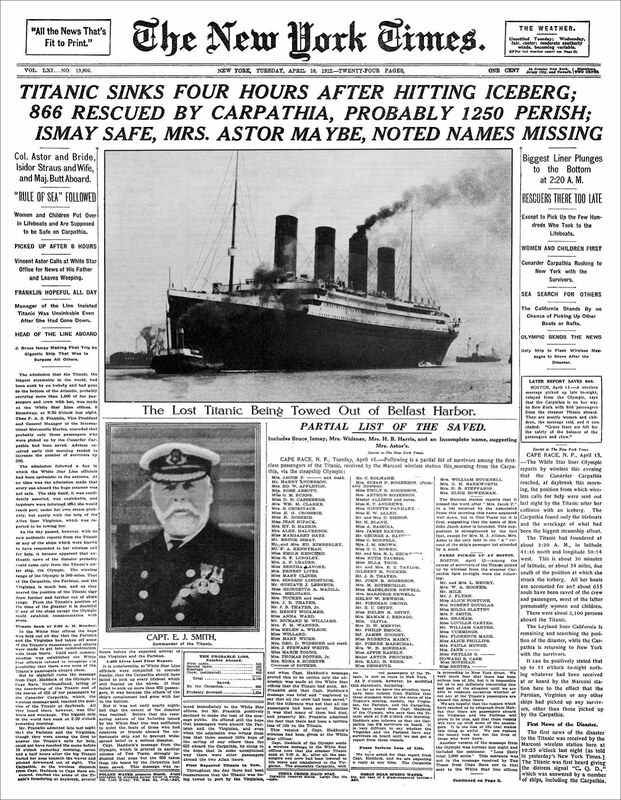 In September of 1985, this group of men found the Titanic in her watery grave, and one thing they all had in common, is that all four of them were wore Rolex Submariner watches. 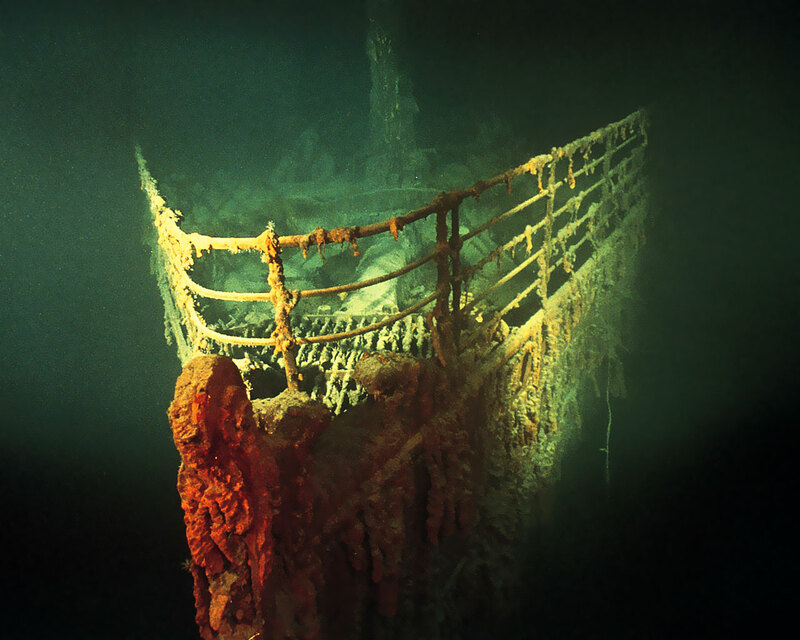 If you want to get all the details about this amazing story I highly recommend reading my story about finding and exploring The Titanic, which is the greatest shipwreck in history. 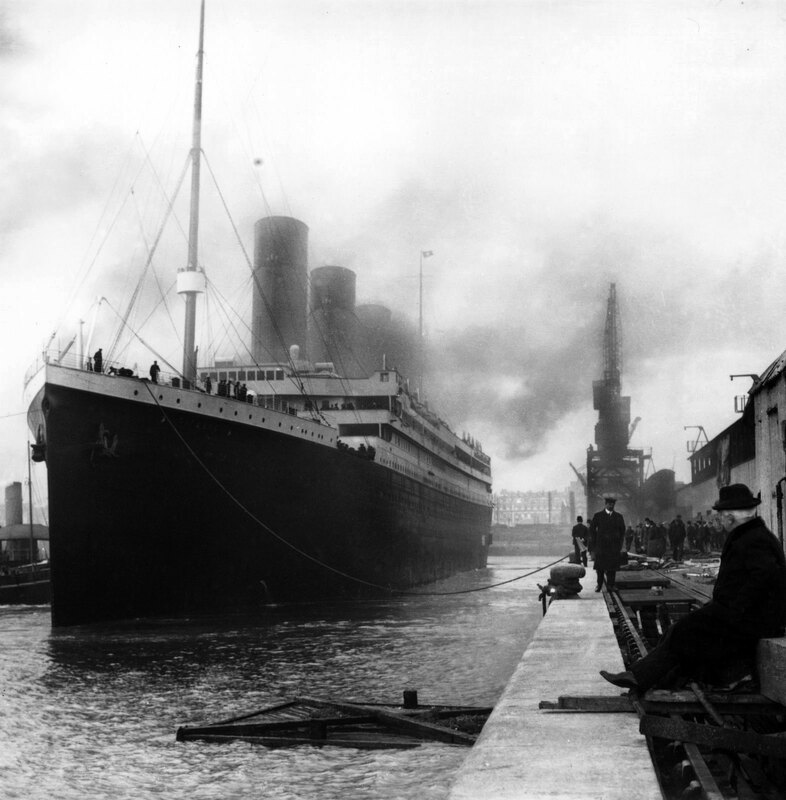 James Cameron is pictured below with Ralph White who was a team member that found the Titanic. 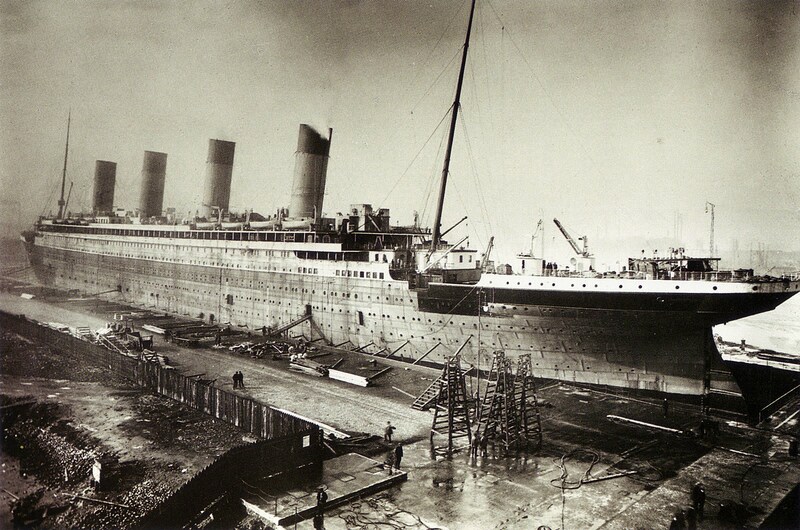 Ralph ended up shooting the 1992 Titanic documentary named Titanica with James Cameron. 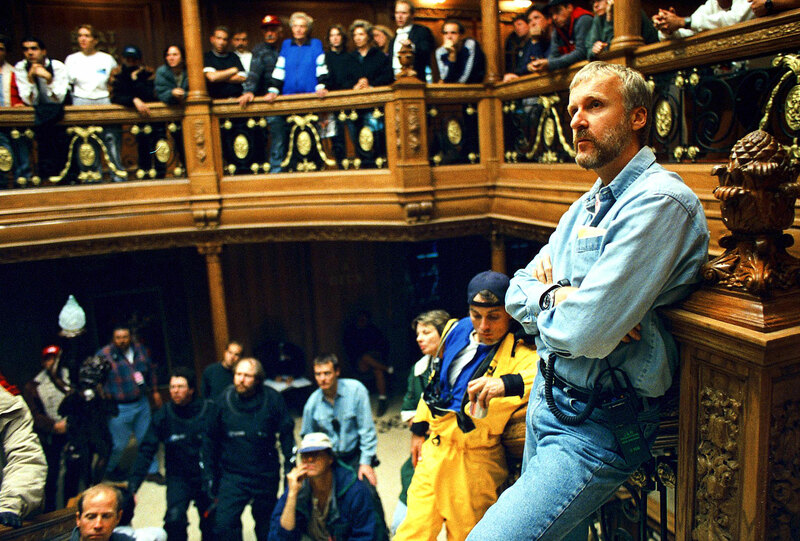 James Cameron would go on to write and direct what is arguably the most successful movie in history, named Titanic in 1997. 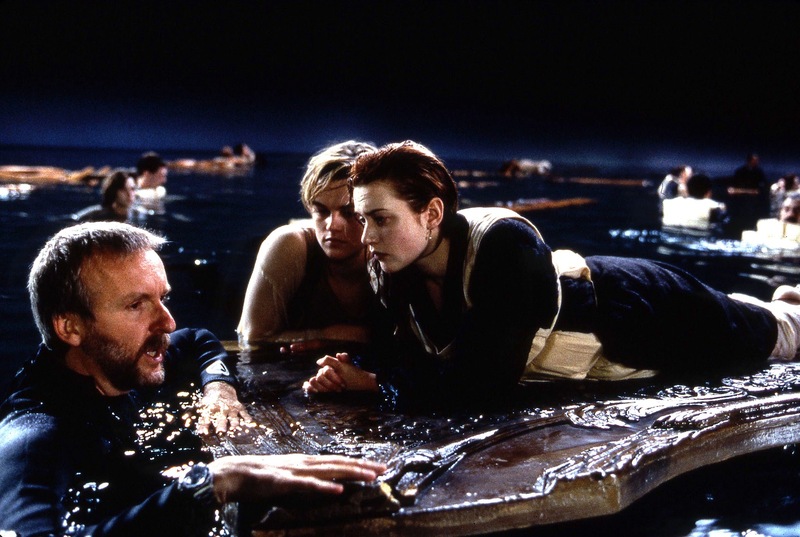 James Cameron also wears a Rolex Submariner as seen in the photo below that were taken during his filming of The Titanic movie. 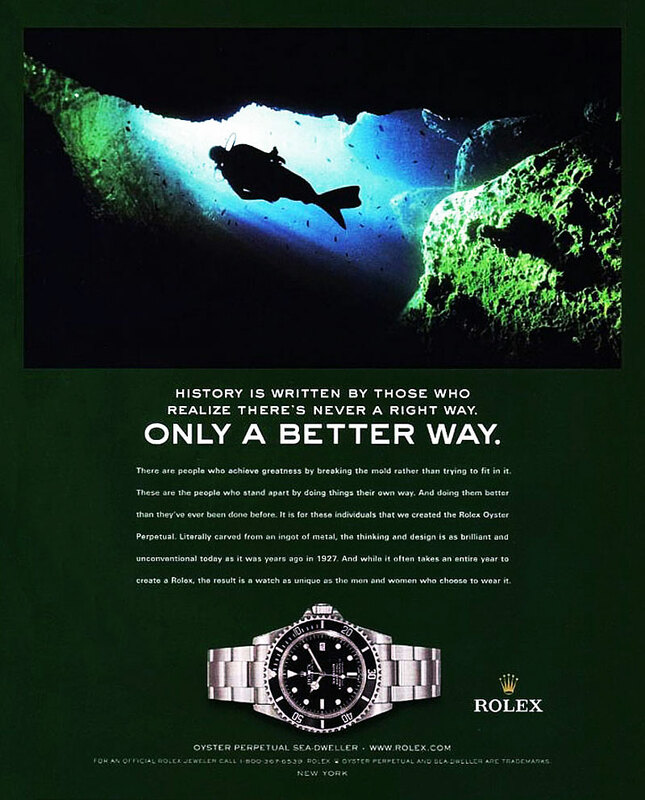 Rolex did not publish many ads for the Rolex SEA-DWELLER, but when they did, they really stood out as seen in this 2003 SEA-DWELLER ad below. 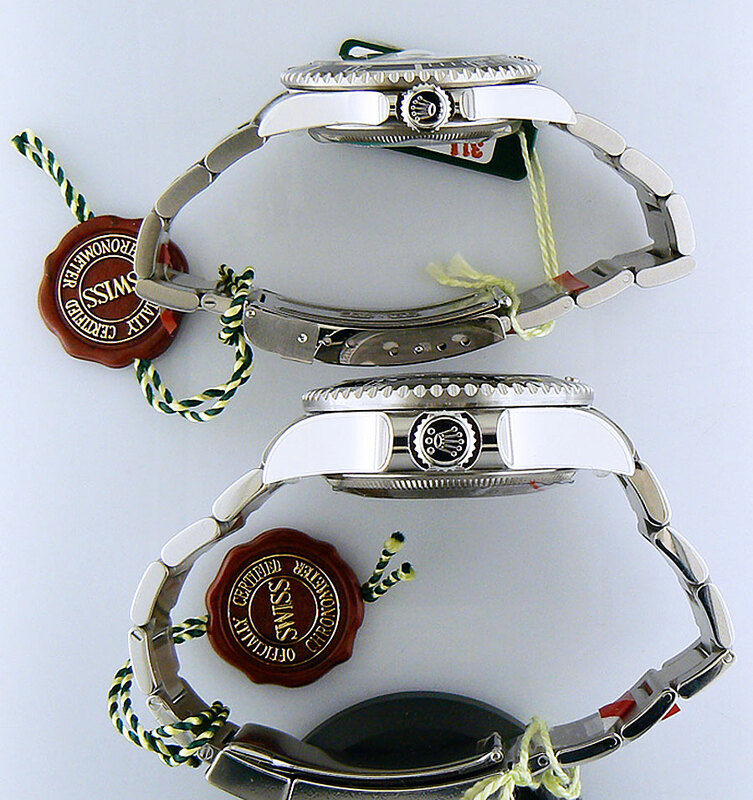 Rolex did something really strange in 2008 at Basel World. 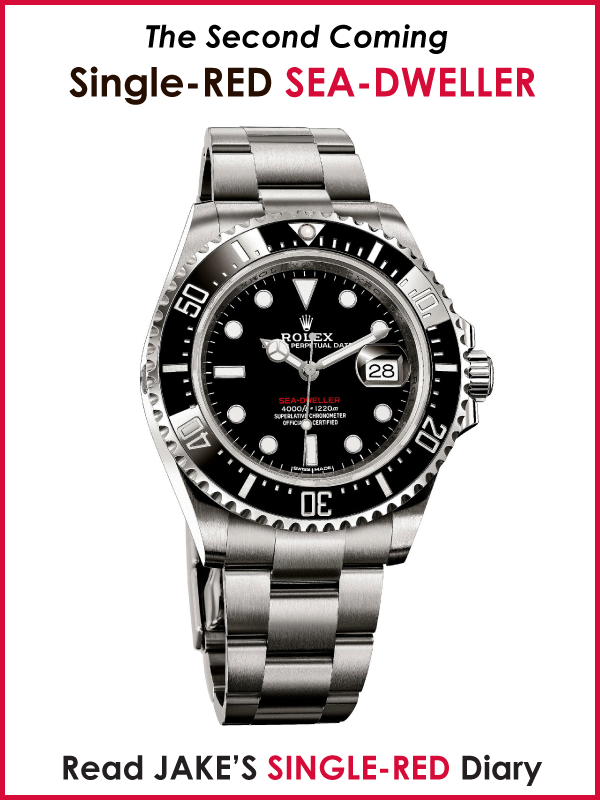 They came out with an all new Rolex SEA-DWELLER model in named The DEEP-SEA, which is pictured below. 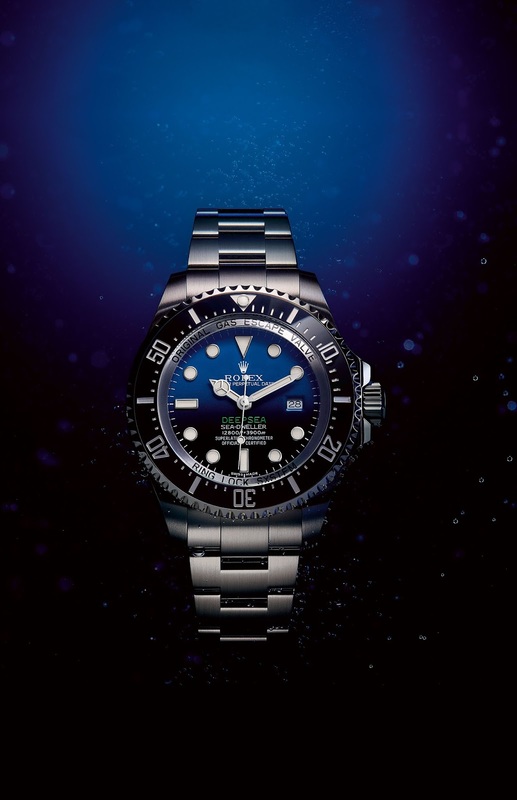 Apparently it was an homage to the original Rolex DEEP-SEA Special Prototype that accompanied the Bathyscaphe Trieste in 1960 on the deepest dive in history. 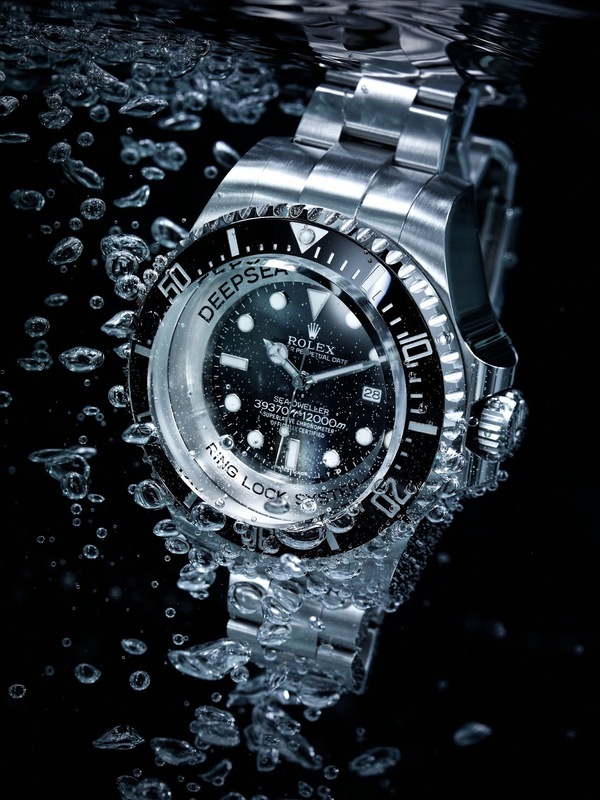 In the photo below wee see legendary and pioneering DEEP-SEA photo journalist, David Doubilet in an ad for the new for 2008 Rolex DEEP-SEA SEA-DWELLER. 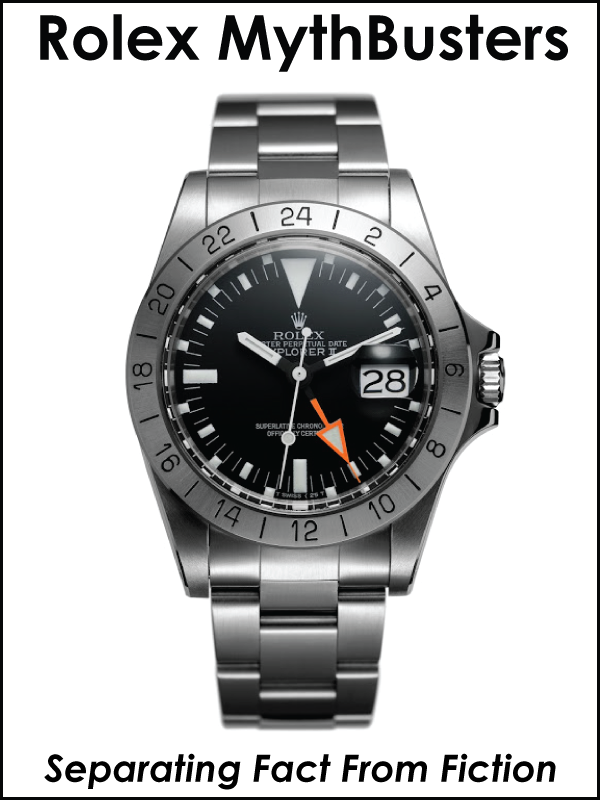 I have to admit that overall I did not like the Rolex DEEP-SEA when it came out. I thought it was ridiculously thick, and I thought the chapter ring that says "Original Gas Escape Valve: Ring Lock System" looked really stupid and unnecessary. 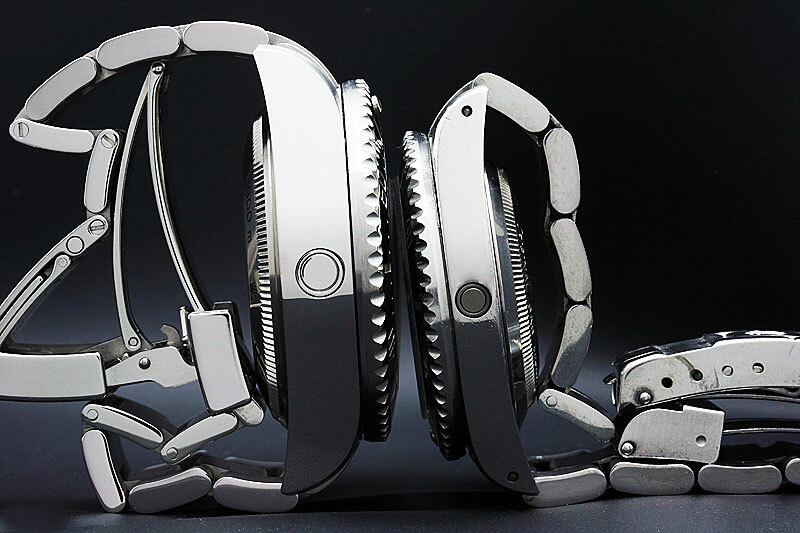 I remember being so bummed on the DEEP-SEA because it has some really, really cool designs elements like the convex crystal, and the glidelock bracelet mechanism was super useful, but overall I could not relate to this watch. 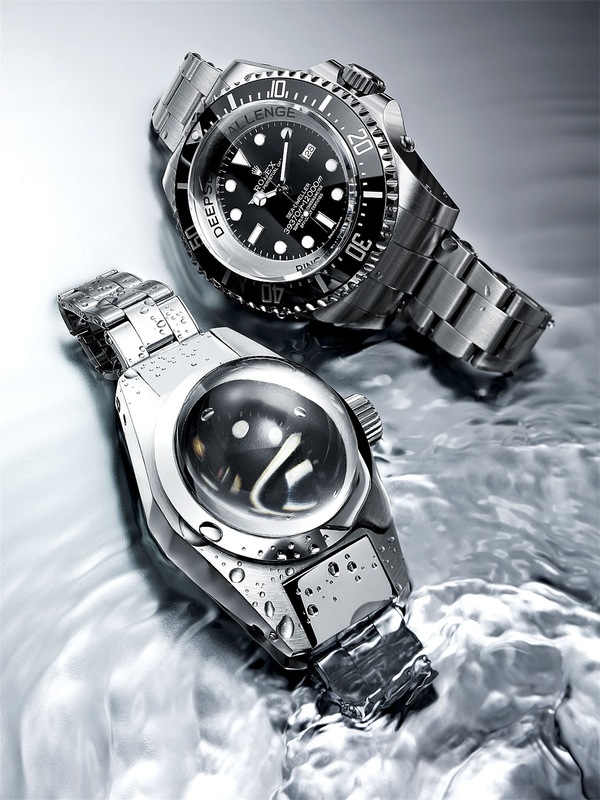 The photos above and below show the DEEP-SEA next to a standard 40MM Rolex SEA-DWELLER. As you can see the DEEP-SEA is ridiculously thick, and even though it is rated down to 12,850 feet, it makes no sense, because a human can't descend that far and function, plus the water depth at even 8000 feet of depth is so great, it would instantly turn a human diver into spam. In other words, the depth rating of this watch is ridiculous and serves no real purpose. 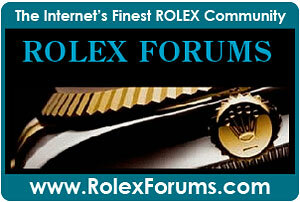 More than anything it shows off Rolex's technical prowess and ability. As I mentioned earlier, my pal Amit refers to the DEEP-SEA as Mr. Potato Head, and I tend to agree. Some Rolex fans would intentionally mispronounce then name of the watch as "The Rolex Dipsy" That being said, it has a huge cult following and is really popular. I had completed dismissed the DEEP-SEA, they the most interesting thing happened!" 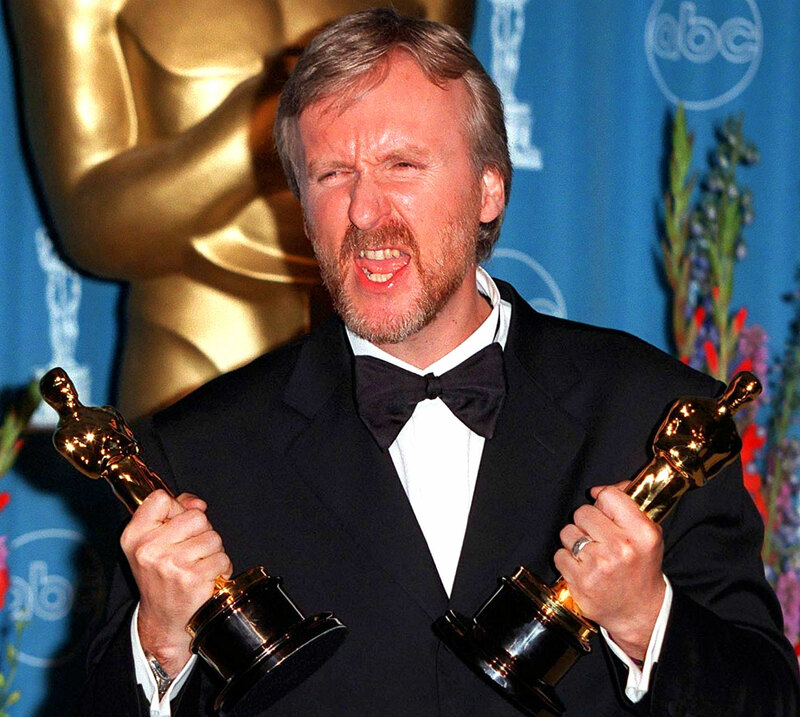 Legendary movie director James Cameron is best known for making epic blockbuster movies like Titanic, which starred Leonardo DiCaprio, and his most recent mega-hit was Avatar. James Cameron is an amazing storyteller and director, which is clearly evident since Titanic and Avatar are the two highest grossing films of all time! 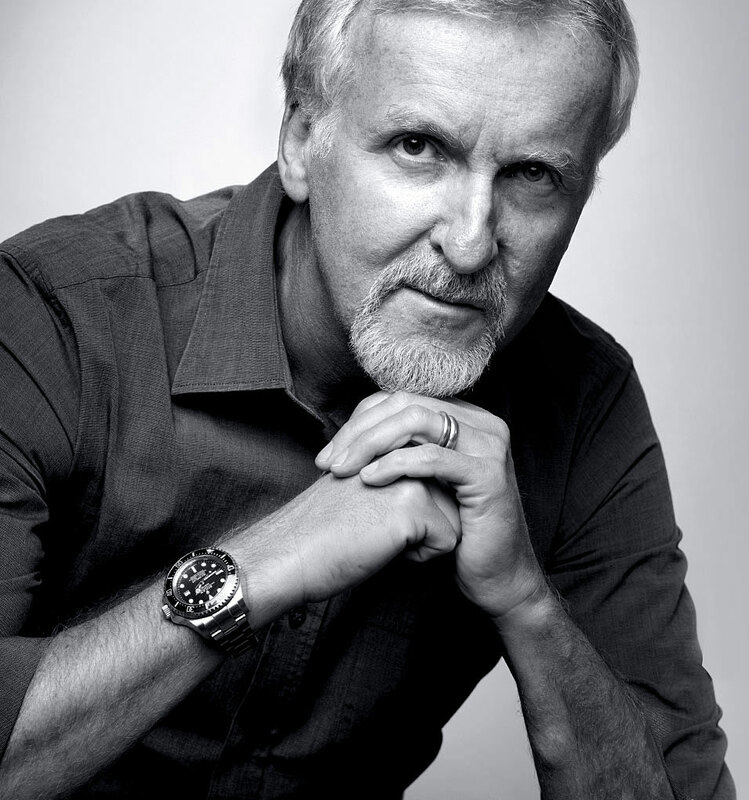 James Cameron has been wearing a Rolex Submariner for over a quarter-century and is also a world-class scientist and DEEP-SEA Explorer. 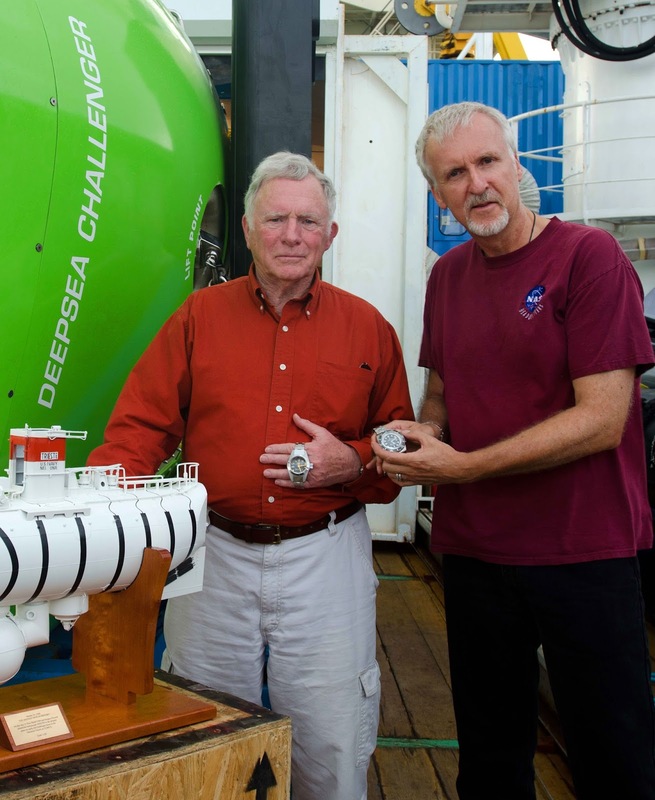 In 2012, James Cameron showcased his custom-built DEEP-SEA Submersible, known as the DEEPSEA CHALLENGER, which attempted to break the all-time depth record set in 1960 by Professor Jacques Piccard, and U.S. Captain Don Walsh. "More than 50 years ago, two men climbed into a massive, blimp-like submersible, descended about 35,800 feet (10,912 meters) to the deepest point in the ocean, and became the first people to observe the dark underworld of one of Earth’s most extreme environments. No one has been back since. But that’s about to change. 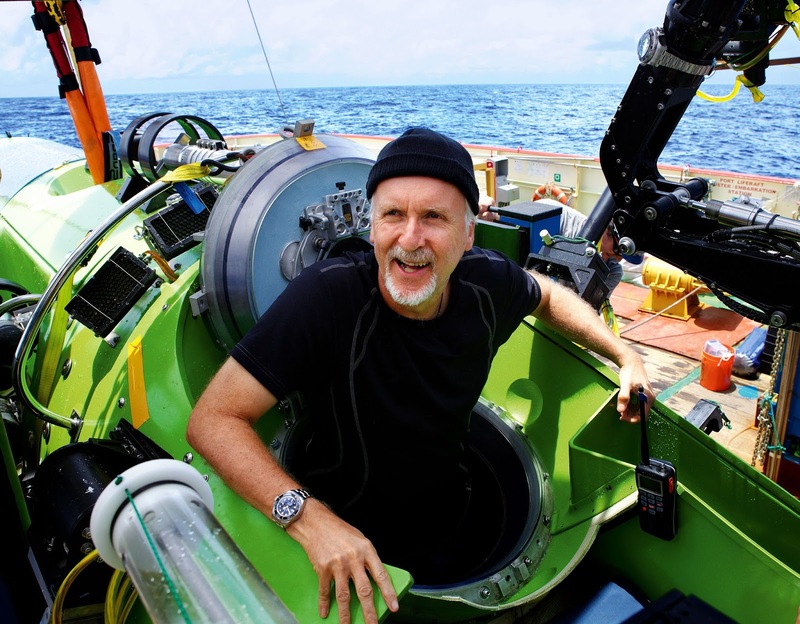 James Cameron, a National Geographic explorer-in-residence, plans to dive to this point, known as the Challenger Deep in the Mariana Trench, in a custom-built submersible that he co-designed. 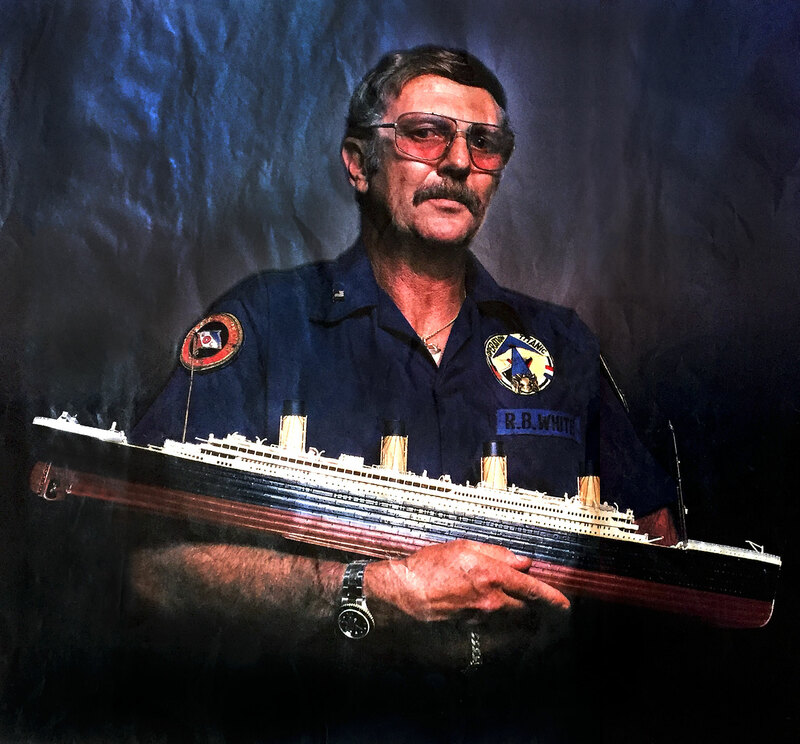 Although best known for directing films such as Titanic and Avatar, Cameron is an avid explorer with 72 submersible dives to his credit—51 of which were in Russian Mir submersibles to depths of up to 16,000 feet (4,877 meters), including 33 to Titanic. For this expedition, Cameron will squeeze into a pilot sphere so small he won’t be able to extend his arms. He will be the sole occupant in a complex, 24-foot-long (7.3-meter-long) craft made primarily of highly specialized glass foam. As he maneuvers on the ocean floor amid unexplored terrain and strange new animals, Cameron will be filming a feature-length documentary and collecting samples for historic research. Why? To promote exploration and scientific discovery. The dive is part of the DEEPSEA CHALLENGE expedition, a partnership with National Geographic that will take Cameron, along with fellow pilot Ron Allum and a team of engineers, scientists, educators, and journalists, to the greatest depths of the ocean—places where sunlight doesn’t penetrate and pressure can be a thousand times what we experience on land. After years of preparation, the team will head to the Mariana Trench, a 1,500-mile-long (2,400-kilometer-long) scar at the bottom of the western Pacific Ocean. 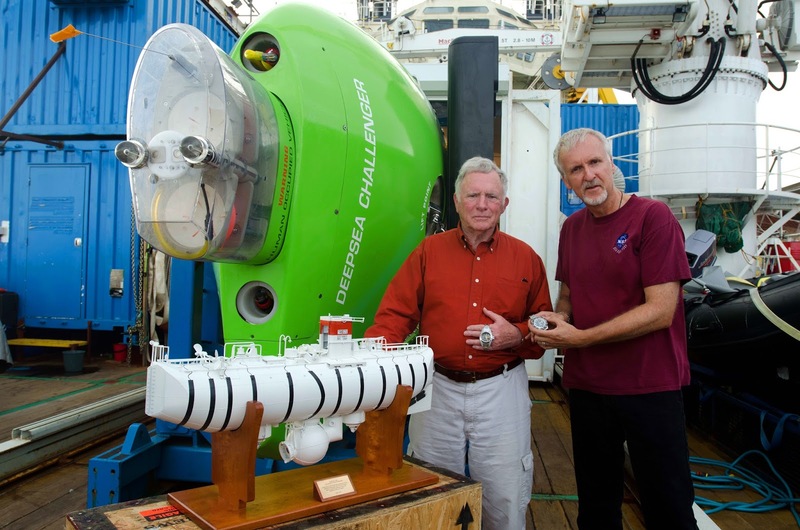 There, about 200 miles (320 kilometers) from Guam, Cameron will continue the work that Don Walsh and Jacques Piccard, the first men to dive the trench in the bathyscaphe Trieste, started in 1960. 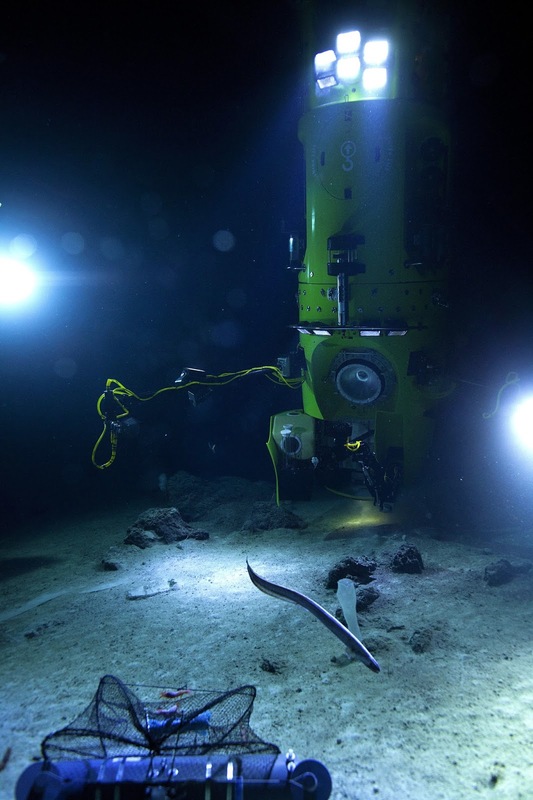 While the Trieste was not equipped to take pictures or get samples, Cameron and his DEEPSEA CHALLENGER submersible will be armed with multiple cameras and a mechanical arm for scooping up rocks and animals. These samples could enable groundbreaking discoveries: Studying the forces that shape these trenches could help us to better understand the earthquakes that cause devastating tsunamis; studying the fauna that survives there could lead to breakthroughs in biotechnology and our understanding of how life began. 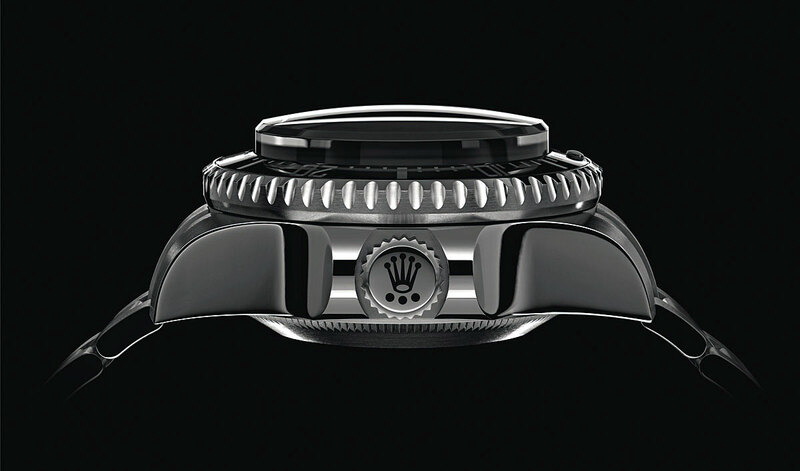 As previously mentioned, when U.S. Navy Captain Don Walsh and Professor Jacques Piccard set the all time depth-record in 1960, they had a Rolex DEEPSEA Special prototype (pictured below) attached to the outside of the Bathyescaphe Trieste, which traveled down to ocean floor, and came back up to the surface in perfect working order. 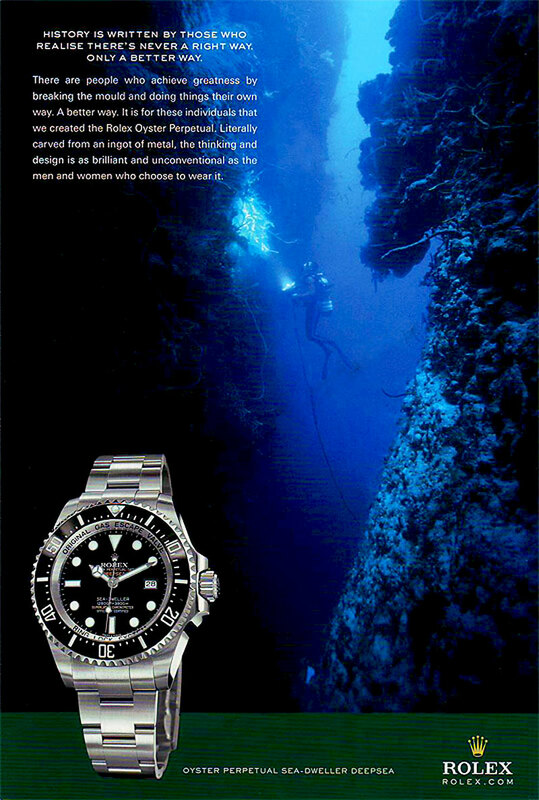 When James Cameron returned to the deepest known part of the ocean to set an all time solo depth record, he returned with a trusted Rolex companion, which was attached to the outside of his DEEPSEA CHALLENGER Submersible, and this time he had a 51.4MM Rolex DEEPSEA CHALLENGER watch which Rolex made just for his dive, and it is pictured below. A Symbol Of Supermacy. 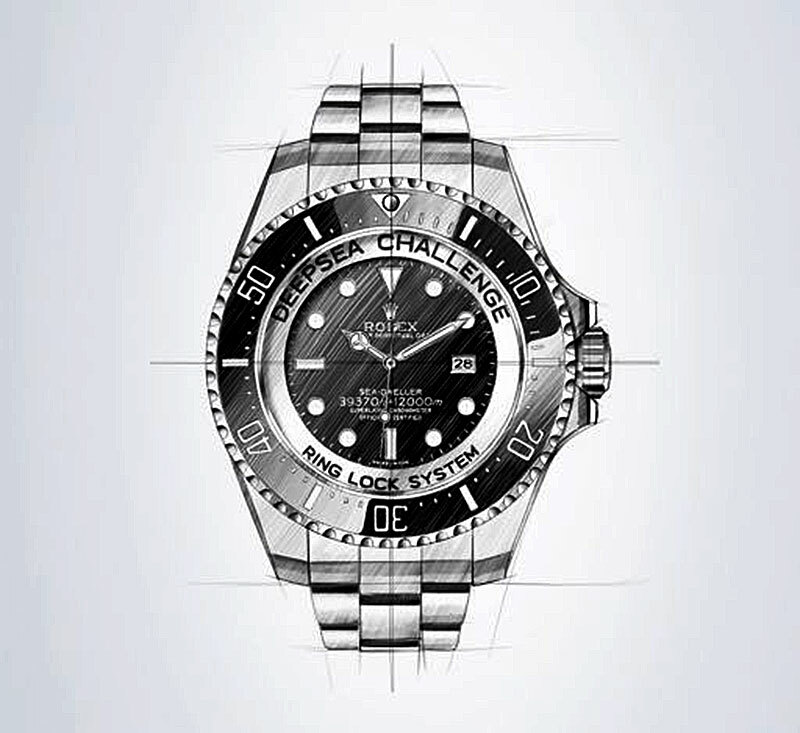 The ROLEX DEEPSEA CHALLENGE symbolizes the brand's supremacy in mastering waterproofness. 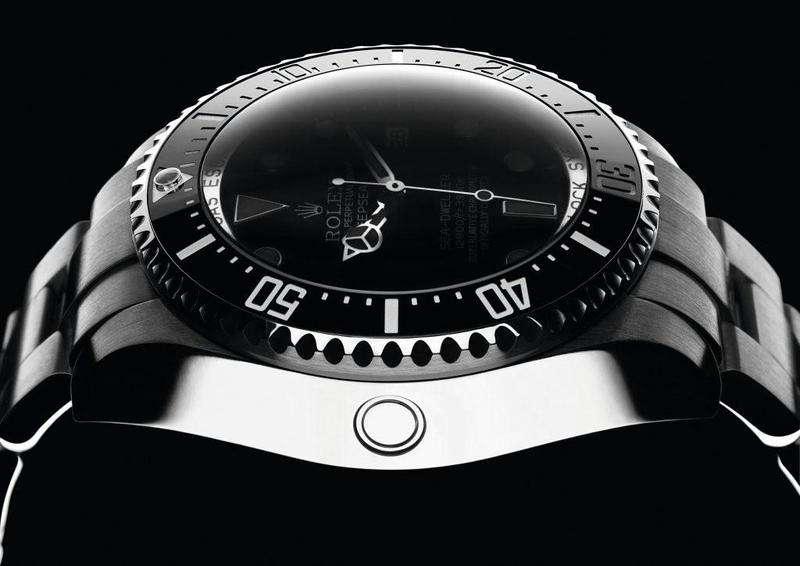 Its spirit and the real-life circumstances for which it was developed echo the approach adopted for the Rolex experimental DEEP SEA SPECIAL model, which in 1960 accompanied the bathyscaphe Trieste on its record descent to a depth of 10,916 meters (35,815 feet) at the bottom of the Mariana Trench." Human adventure and technological innovation. This watch bears witness in a spectacular way to the privileged ties that link Rolex to exploration in general and to the underwater world in particular. The ROLEX DEEPSEA CHALLENGE perpetuates a story combining human adventure and technology, innovation and the constant pursuit of excellence. 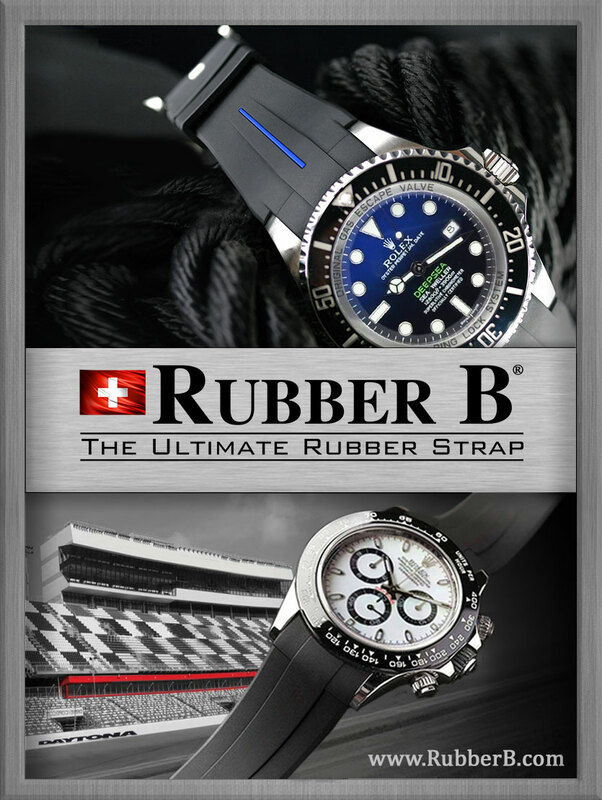 An adventure punctuated with exceptional moments, some of which have entered the annals of history, when Rolex watches have proven their mettle under extreme conditions by accompanying men and women in their quest for the absolute." 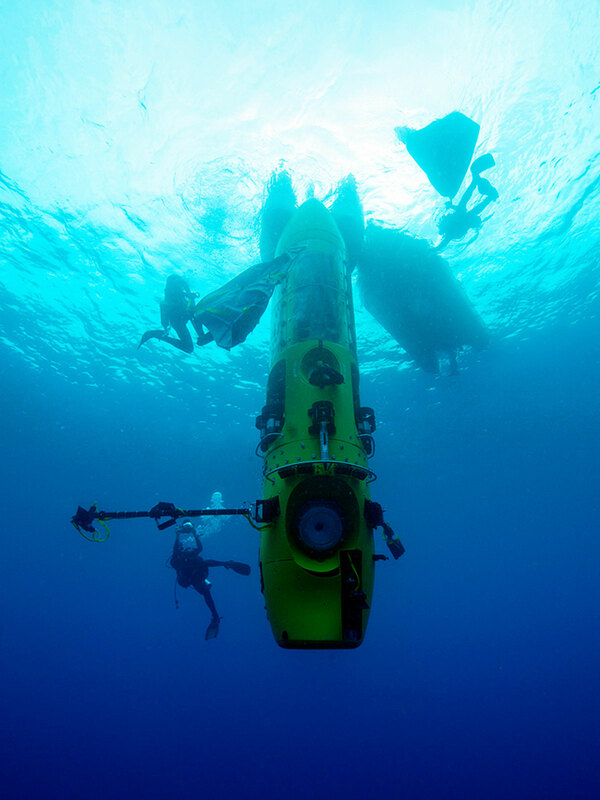 The photo below shows James Cameron's DEEPSEA CHALLENGER Submersible as it is being lowered into the Pacific Ocean. The next photo below compares the size of the U.S. Navy's Bathyscaphe Trieste to the size of James Cameron's DEEPSEA CHALLENGER, which is a one man submersible, that was designed and custom-made to try and beat the record of the Trieste. 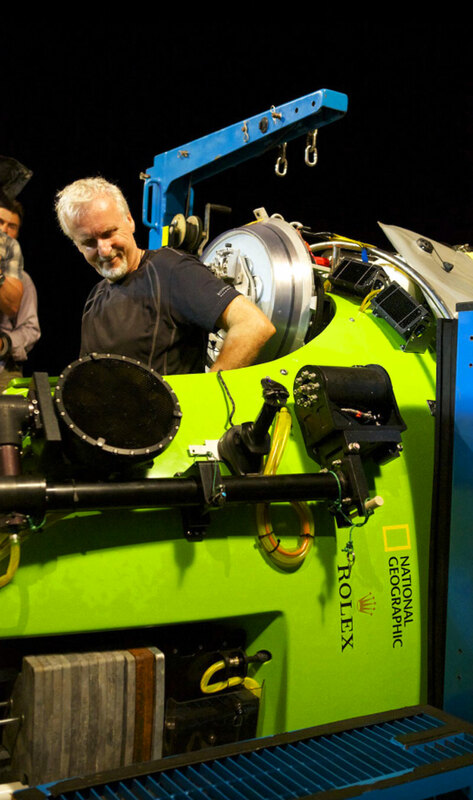 The photo below shows James Cameron's as he prepared to be bolted into his DEEPSEA CHALLENGER Submarine in the very early morning of March 26, 2012. "I grew up on a steady diet of science fiction at a time when people where living a science fiction reality. People were going to the Moon, and Cousteau was exploring the ocean. And that's what I grew up with, what I valued from my childhood." 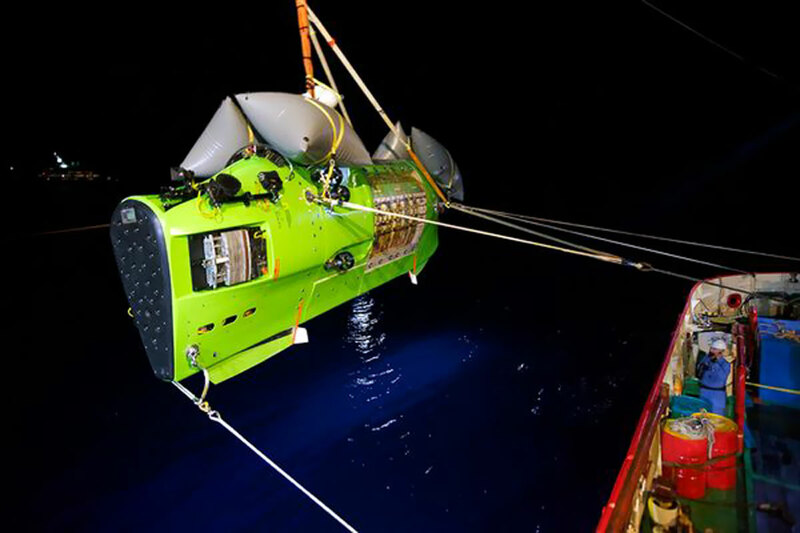 This next video and photo below shows James Cameron's DEEPSEA CHALLENGER as it was lowered into the Pacific Ocean today around 2AM Mariana Trench time to begin it's record-breaking descent. The photo below shows James Cameron's DEEPSEA CHALLENGER parked on the ocean floor. 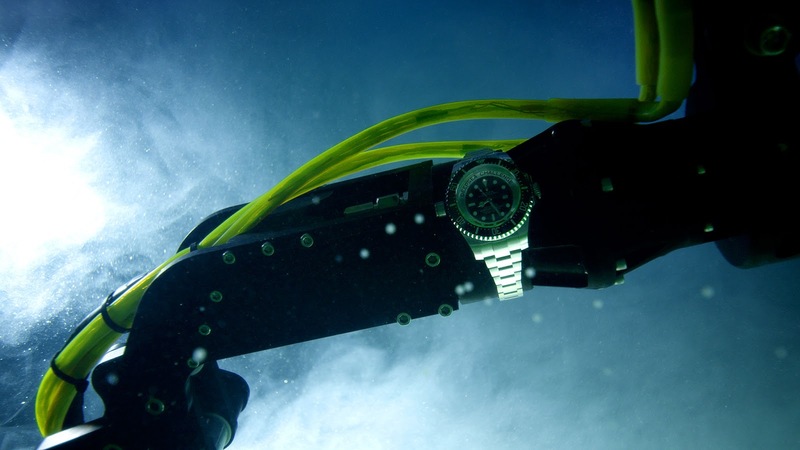 The photo below shows the Rolex DEEPSEA CHALLENGE Watch which was attached to the robotic arm on the James Cameron's DEEPSEA CHALLENGER submersible. 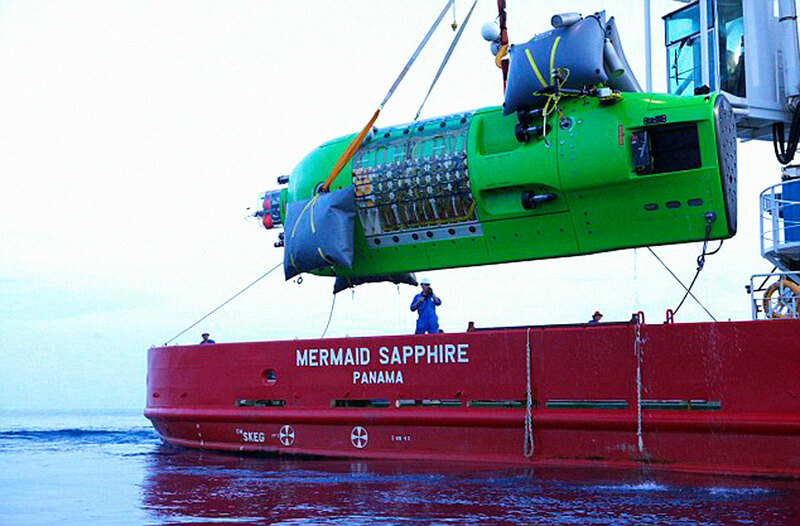 The photo below shows James Cameron's DEEPSEA CHALLENGER as it is surfaces, after it traveled down to the same place in the Mariana Trench as the Bathyscaphe Trieste in 1960. 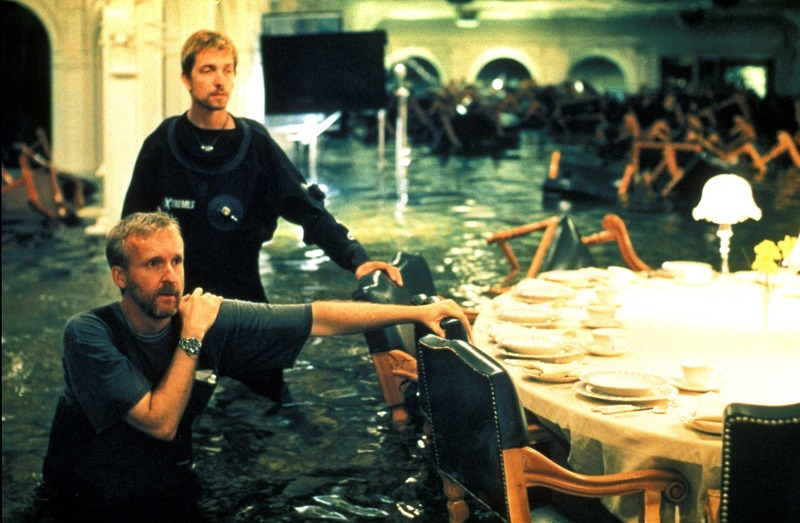 James Cameron came close to matching the depth, but came up 10 feet or so short. 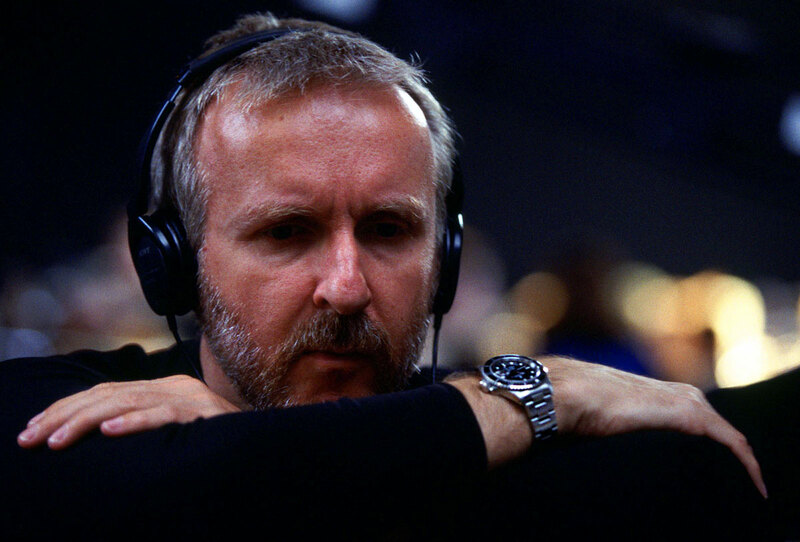 That being said, James Cameron shot a ton of remarkable 5K Super High Definition video using RED super-state-of-the-art cameras, which he is currently working on making into a feature film named DEEPSEA CHALLENGE. The raw video below from National Geographic details James Cameron successful return from his record-setting solo dive. 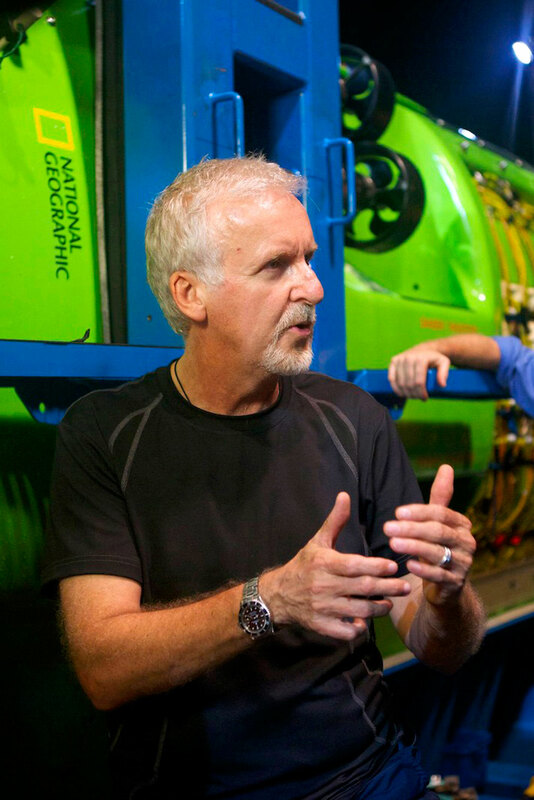 The photo below shows James Cameron just after he opened the highly pressurized hatch of his DEEPSEA CHALLENGER Submersible, and if you look closely you will notice that there is a specially designed Rolex DEEP-SEA CHALLENGE watch attached to the robotic arm in the upper right-hand section of the photo. Rolex made this special model just for James Cameron's record setting dive attempt, and just like the original DEEP-SEA SPECIAL, it came up to the surface in perfect working condition. 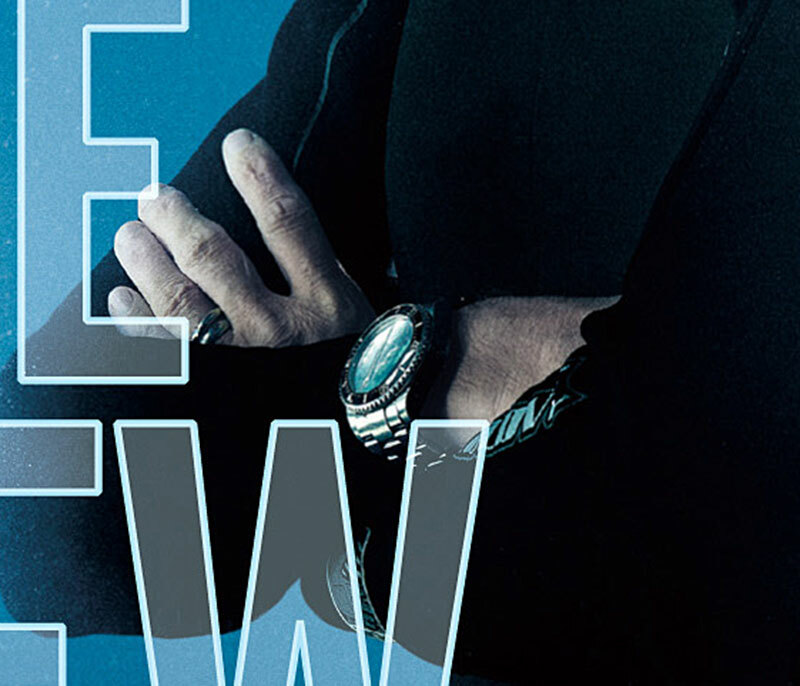 In the close-up photo seen below, we witness James Cameron wearing a standard Rolex DEEP-SEA SEA-DWELLER on his wrist. 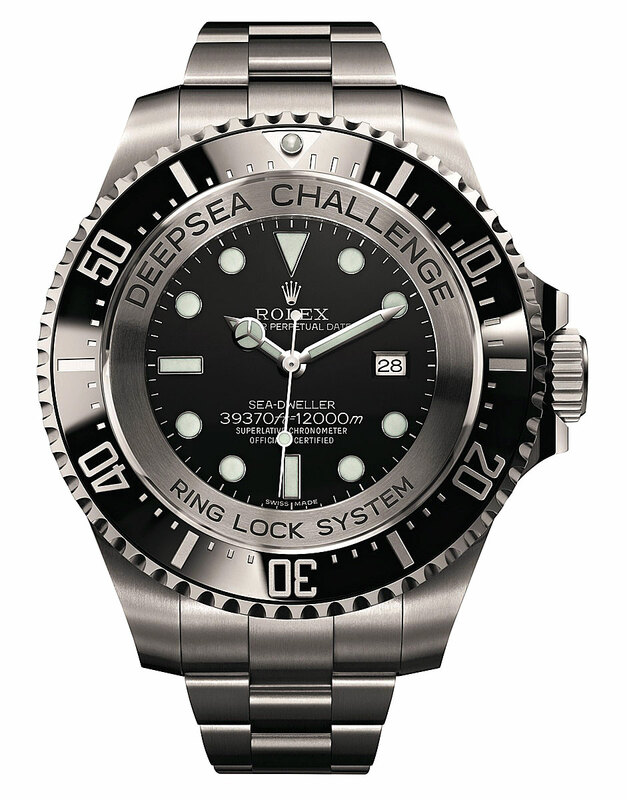 "The Rolex Deepsea Challenge was the reliable companion throughout the dive; it was on the sub's manipulator arm and working precisely at 10,898 meters down at the bottom of the Challenger Deep. 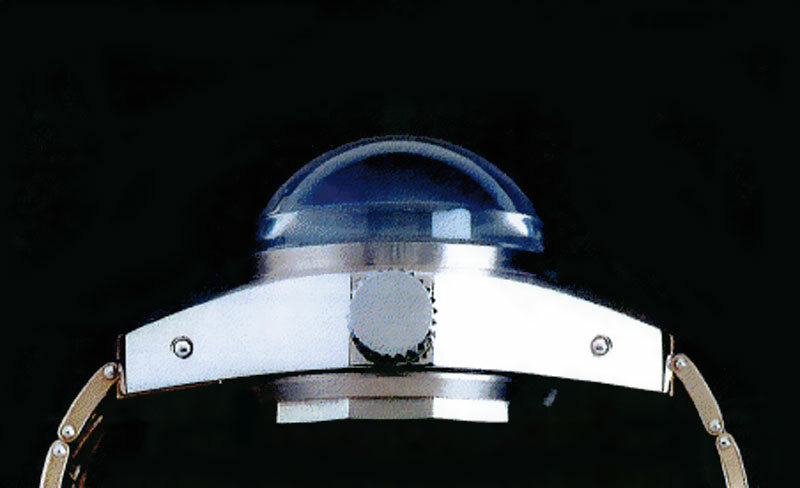 It's a tremendous example of know-how, and an ideal match for the DEEPSEA CHALLENGER submersible." 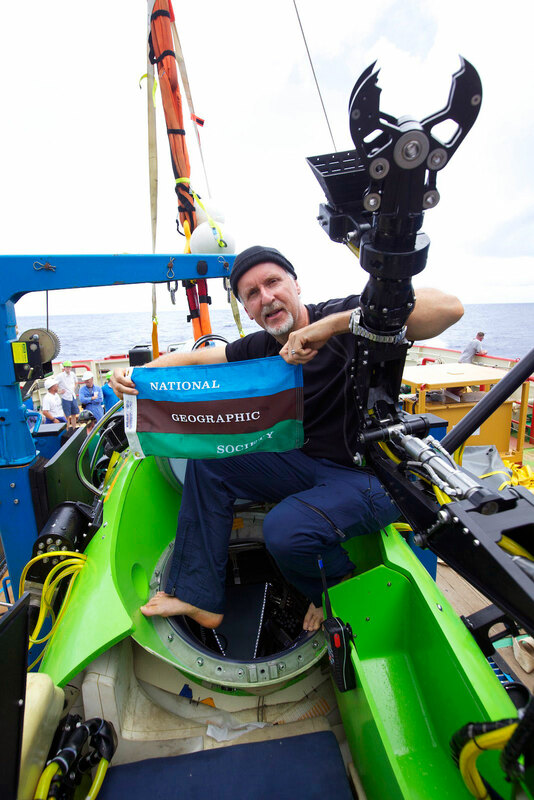 In the photo below we see James Cameron posing with the National Geographic Society flag, just after he surfaced. 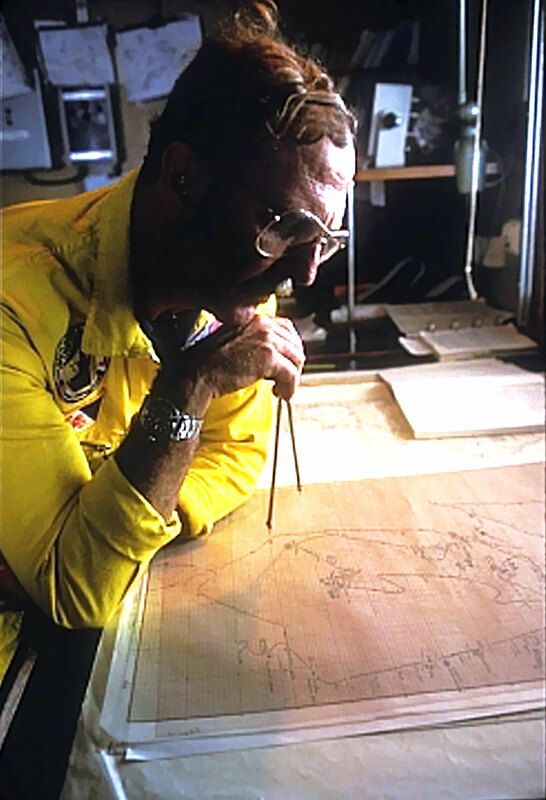 I think James Cameron is an amazing explorer, and I LOVE this photo, which has a definite modern Jacques-Yves Cousteau vibe. 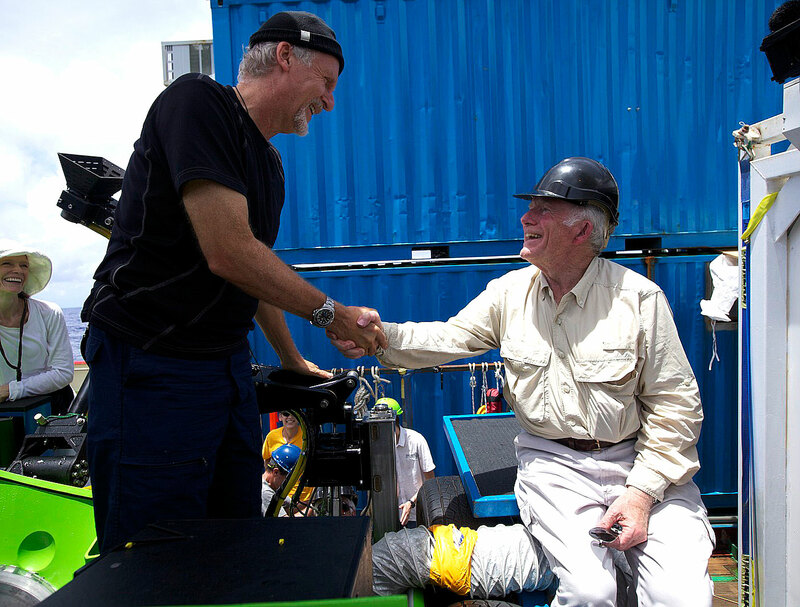 In the photo below we see James Cameron shaking hands with Captain Don Walsh, who successfully set the all-time depth record in 1960 while piloting the U.S. Navy Bathyscaphe Trieste in the same waters. 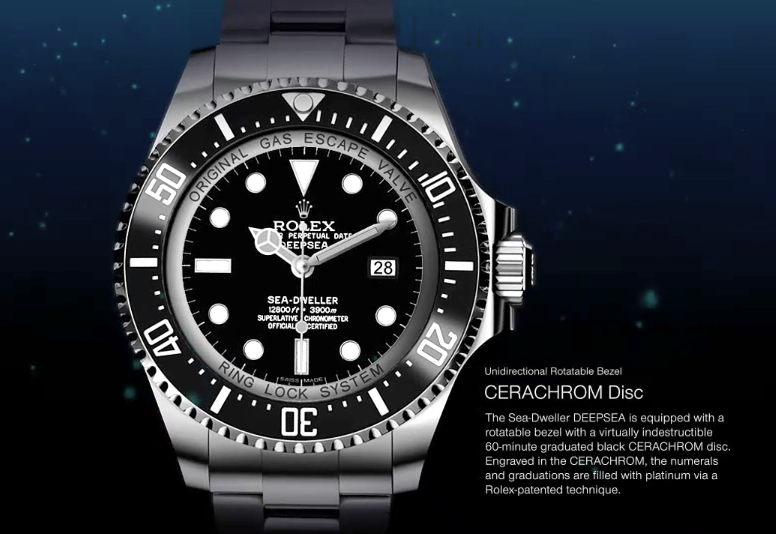 Not only was retired U.S. Navy Captain Don Walsh on board, but as a Rolex ambassador, it was his idea to have Rolex collaborate with James Cameron to put a new Rolex DEEP-SEA to this test on this fantastic journey. 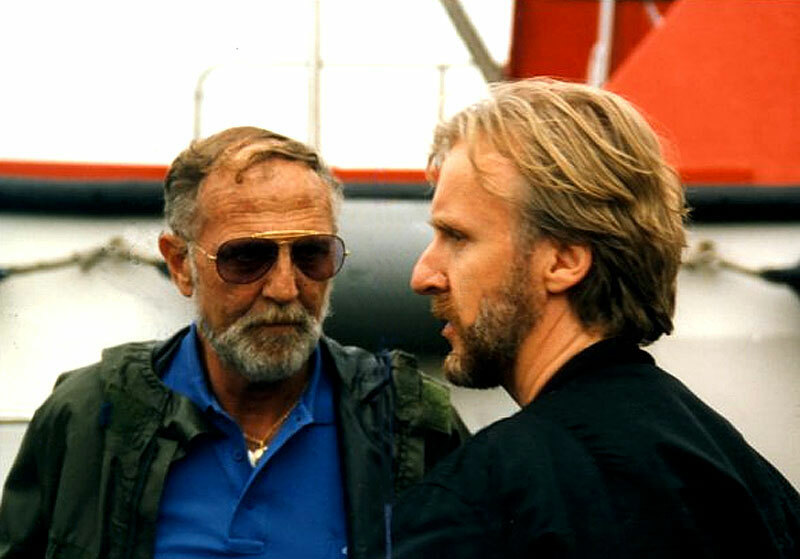 Captain Walsh also served as an indispensable consultant to James Cameron on this epic project, and in the photos above and below we see them after the record dive and Captain Walsh is proudly posing with the original Rolex DEEP-SEA Special prototype that accompanied him on the outside of his Bathyscaphe Trieste, and James Cameron is also proudly posing with the Rolex DEEP-SEA CHALLENGE watch that accompanied him on the outside of his DEEPSEA CHALLENGER Submersible. 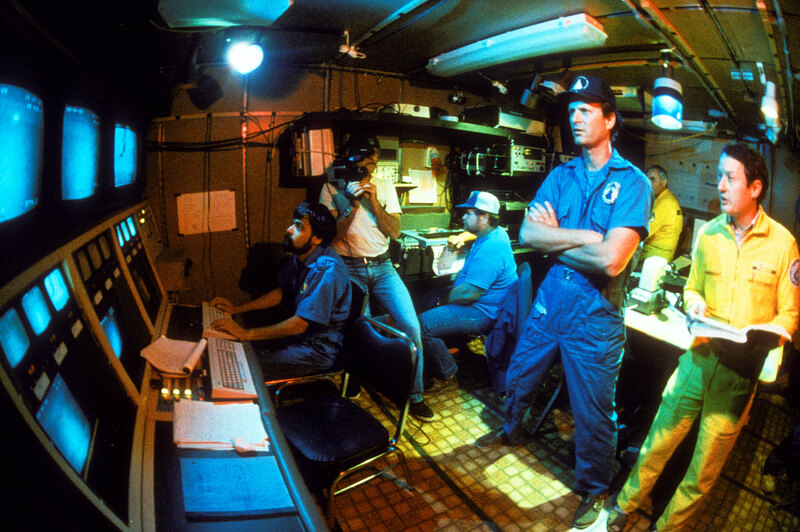 In the photo below we see James Cameron's DEEPSEA CHALLENGER on deck in the background, and we see Captain Walsh standing behind a scaled model of the original Bathyscaphe Trieste. 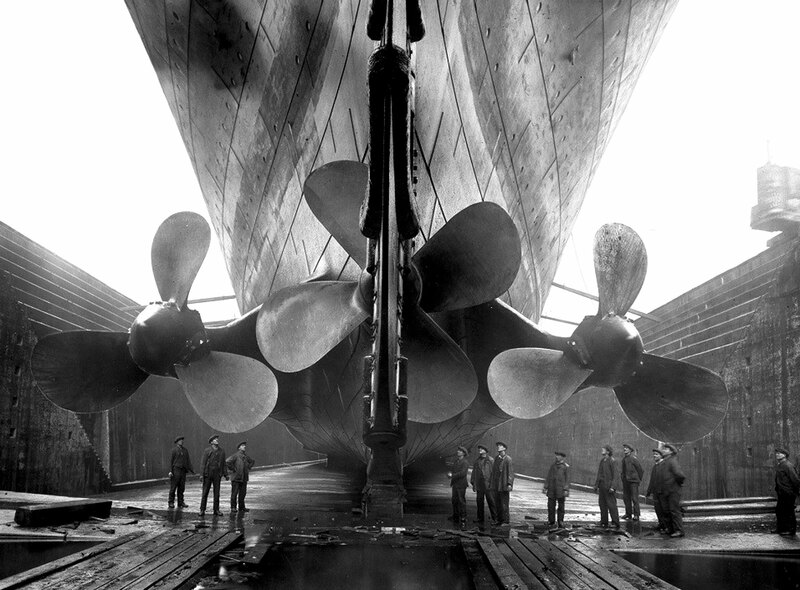 It is amazing how cool and historical these images are. Talk about iconic worlds colliding. This photo really captures the core-essence of The Rolex Spirit of Enquiry and Exploration. 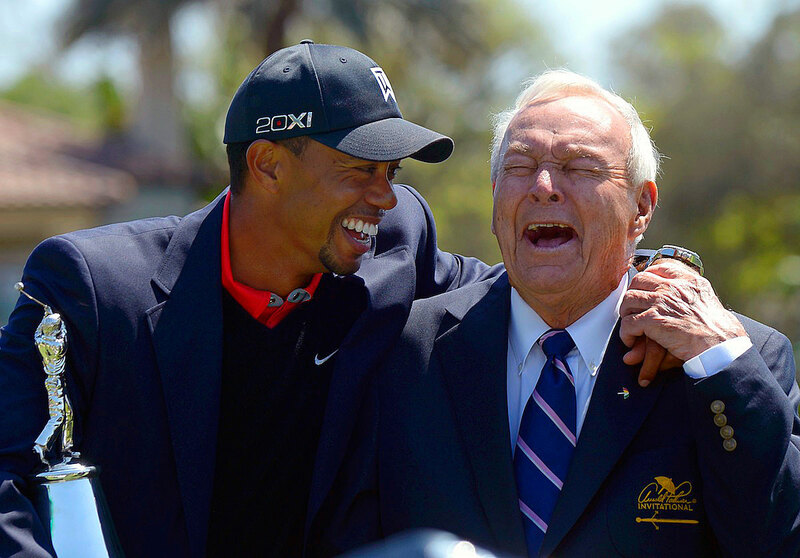 This is as real as the real deal gets–the OG hanging-tough with the NG. I live-blogged James Cameron's conquest of the Deep-Sea on Jake's Rolex World with minute by minute updates as the whole thing unfolded live. 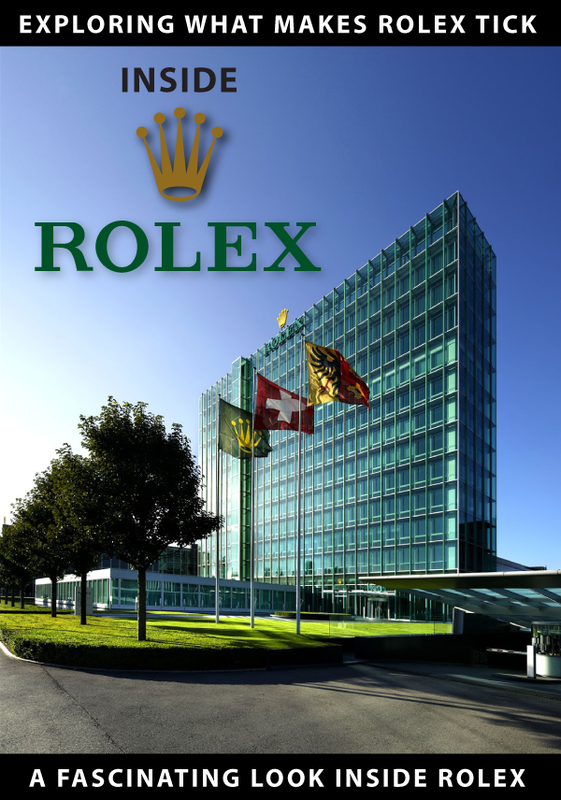 It is fascinating to note that I am 50 years old at the time of this writing, and this is the only Rolex related event I have ever witnessed in my lifetime as an adult, and I hope to see many more! 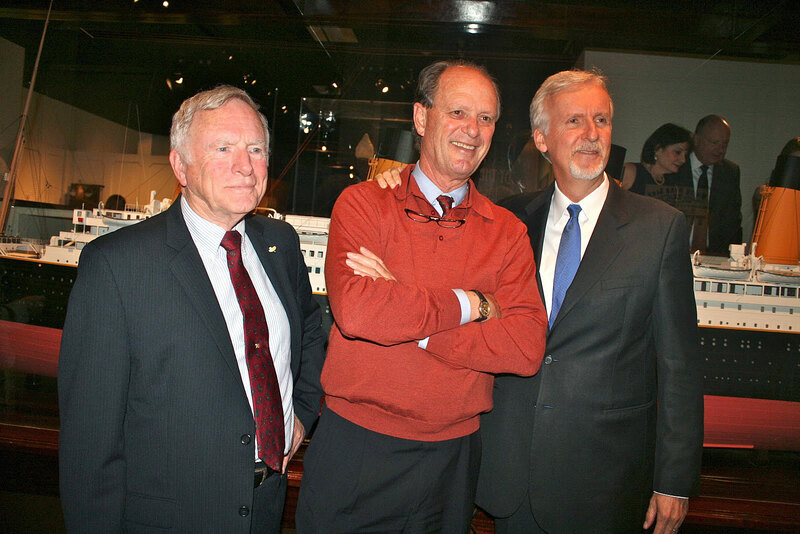 In this next photo we see three of the greatest explorers alive; Captain Don Walsh, Doctor Robert Ballard (who discovered the Titanic), and James Cameron. 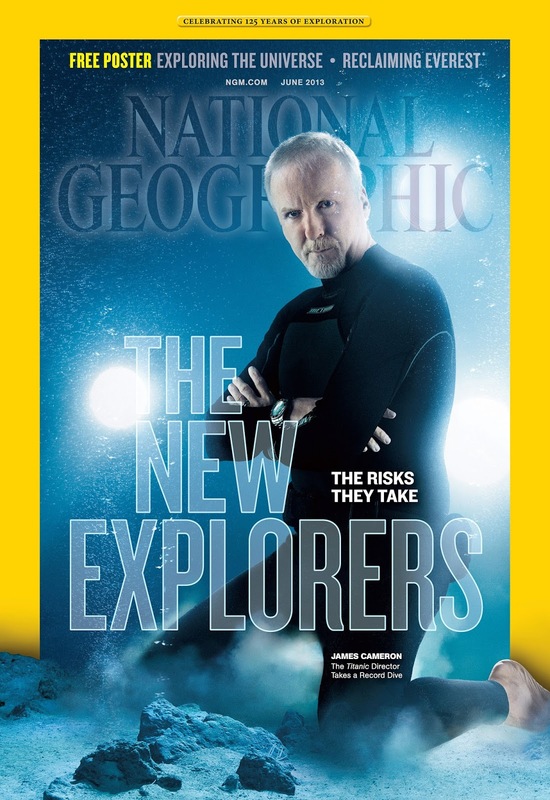 In the photo below we see James Cameron on the cover of National Geographic, and we see the headline: "The New Explorers" on the cover. I sincerely hope Rolex does everything they can now and in the future to assist in supporting this new age of exploration that is upon us. 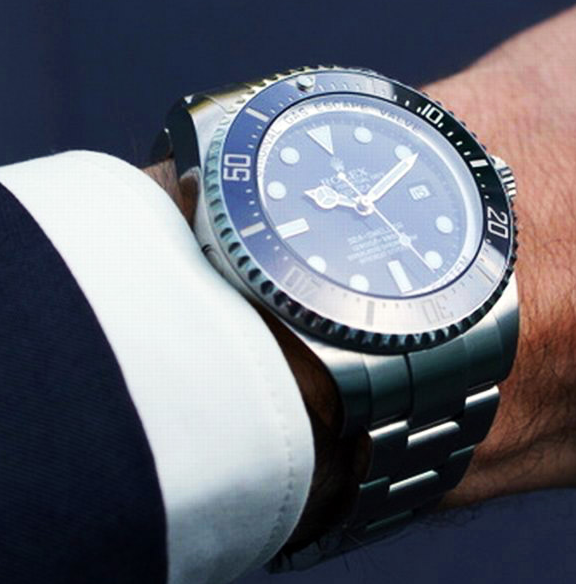 In the photo below we see a close-up of James Cameron's Rolex DEEP-SEA SEA-DWELLER. In the photo below, we see a National Geographic video interview featuring James Cameron, that goes into great detail on his amazing scientific discoveries from his dive. When you listen to James Cameron speak, you can't help but be in awe of how intelligent he is. 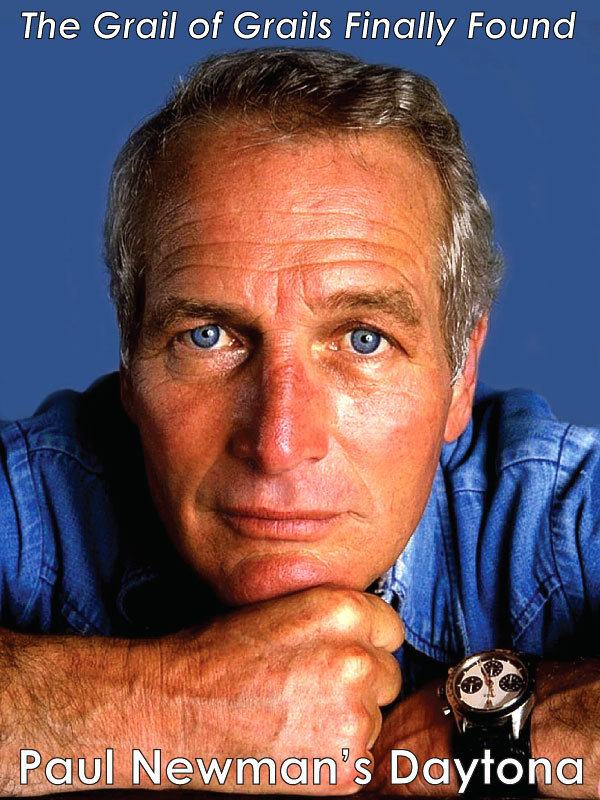 Next up, we see another fascinating James Cameron interview, this time recorded at Rolex World Headquarters in Geneva, Switzerland where he discusses his shared values with Rolex as well as how Rolex was able to build the Rolex DEEP-SEA CHALLENGE watch in ONLY 5-weeks!?!?! 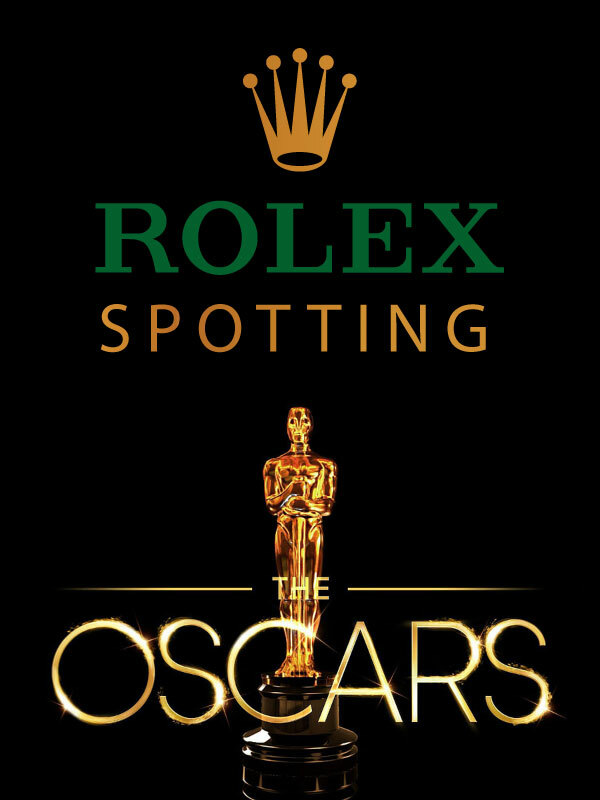 Just to be clear, retired U.S. Captain Don Walsh, who is a Rolex Ambassador, was consulting with James Cameron, and he said to James, "Why don't I reach out to Rolex and see if we can get them to build a new watch to take down on your attempt to break my record?" James agreed, and Captain Walsh contacted Rolex in Geneva to ask if they could meet this incredible challenge. 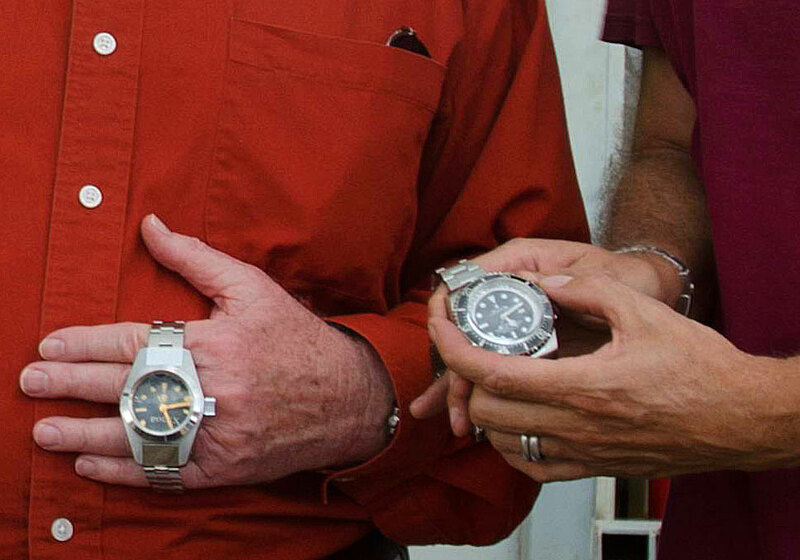 Rolex immediately jumped into action and the video below tells this amazing story. 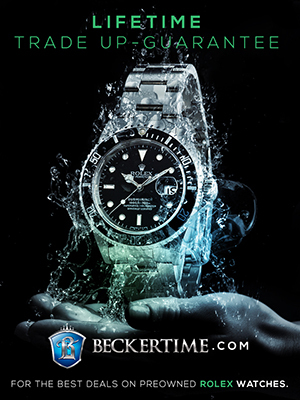 Historically, Rolex has been the true King Of The DEEP-SEA, which stems from their experience with their conquest of the ocean. The Rolex DEEPSEA CHALLENGE watch looks like a Rolex DEEP-SEA SEA-DWELLER on steroids, but the DEEPSEA CHALLENGE is not available to the public for purchase. Instead it is an experimental watch. 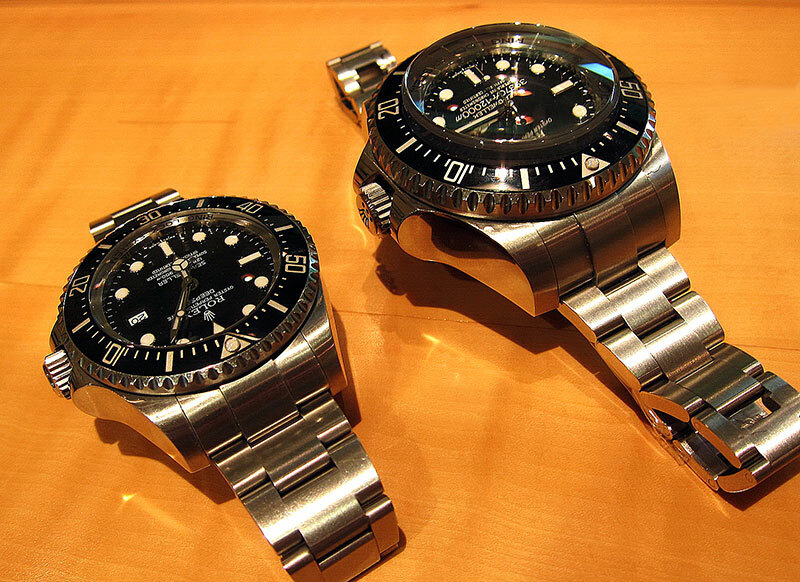 The photos below shows and original Rolex DEEPSEA Special from 1960 next to its grandson, a Rolex DEEPSEA CHALLENGE from 2012. 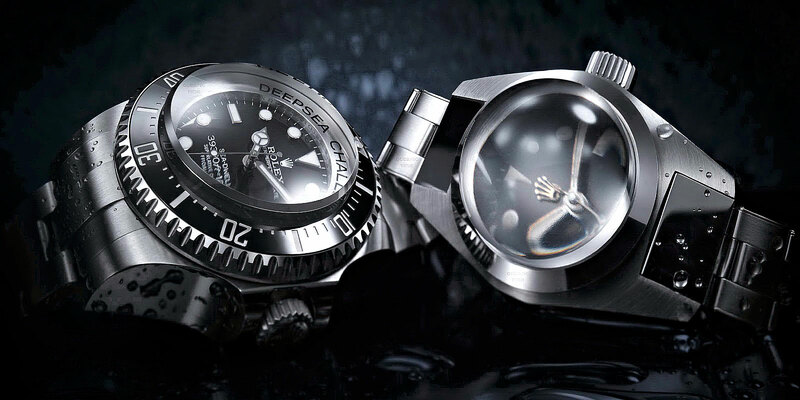 The photo below appears courtesy of OceanTime, and it shows a Rolex DEEPSEA SEA-DWELLER (44MM) next to its bigger brother, the Rolex DEEPSEA CHALLENGE. 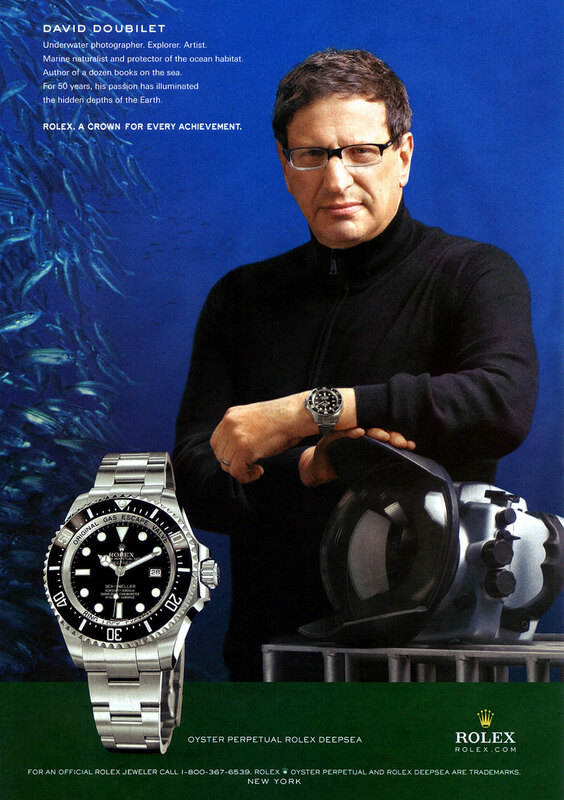 As I mentioned earlier, the Rolex DEEPSEA has been a very popular watch, with many celebrities wearing it. 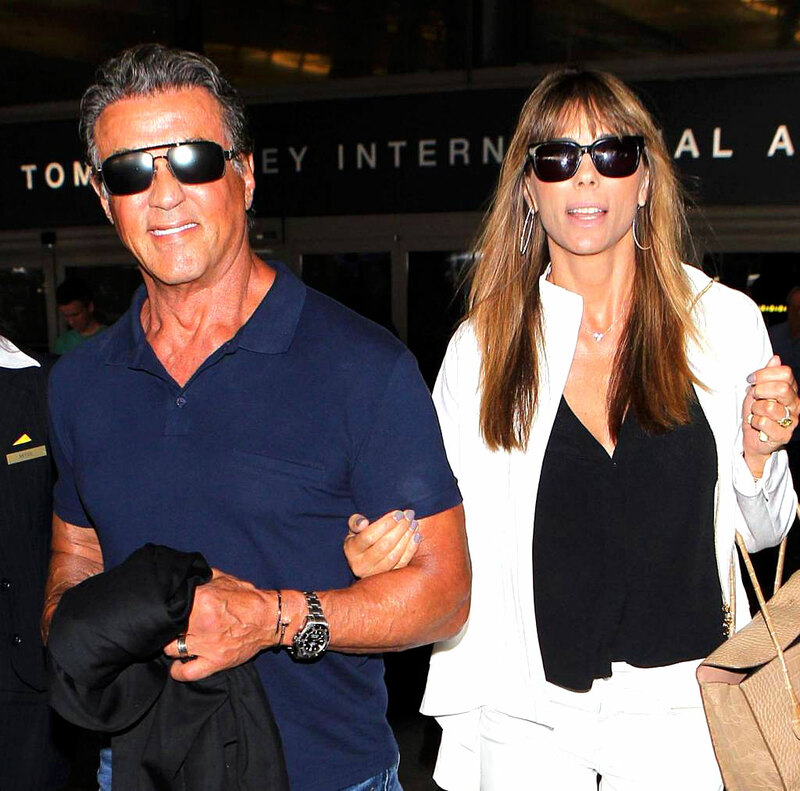 In the photo below we see Sylvester Stallone wearing his Rolex DEEPSEA SEA-DWELLER. 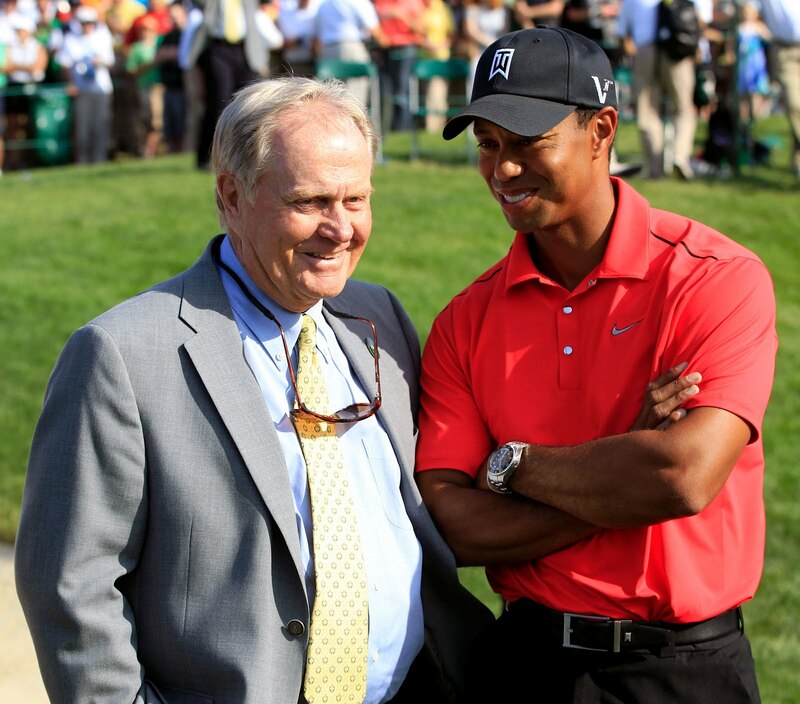 Tiger Woods is another famous celebrity who has been seen many times wearing his Rolex DEEPSEA, as seen in the photo above with fellow Rolex Ambassadors Jack Nickalus, and below with Arnold Palmer. Women have been wearing men's Rolex watches for many decades, and the Rolex DEEPSEA is no exception, as we see below with Lerny Franco, the Olympic Athlete and Model. In the photos below we see Academy Award Winner For Best Actress, Charlize Theron rockin' her Rolex DEEPSEA SEA-DWELLER as she sits front row at a Los Angeles Lakers game. 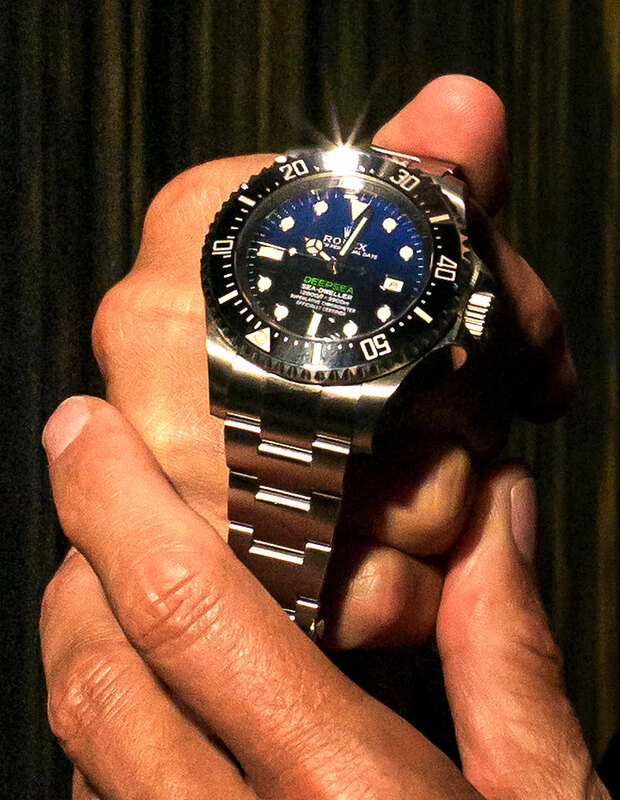 I remember the first time I saw the D-Blue SEA-DWELLER being stunned at how beautiful it was with its blue to black gradient dial, and green DEEPSEA dial designation. 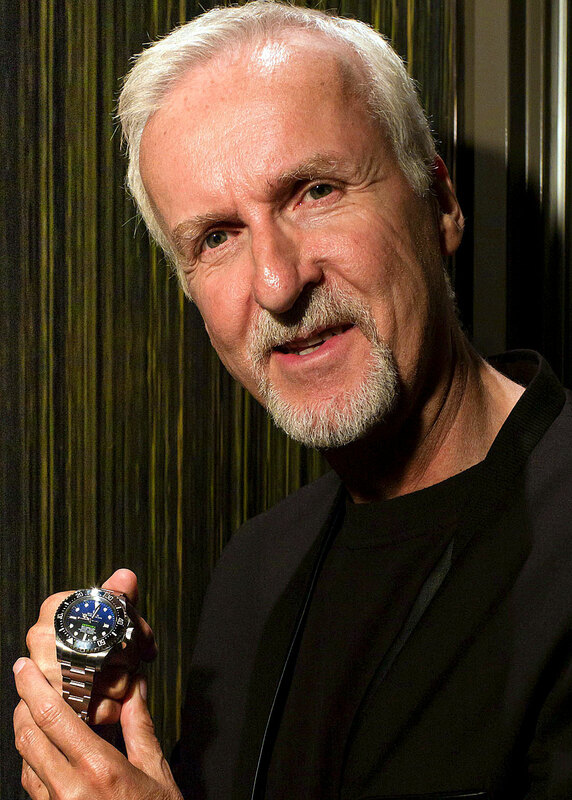 The photo below shows James Cameron holding his DEEPSEA D-Blue, and it appears courtesy of TimeAndWatches.com, which published an amazing interview which I highly recommend you read. 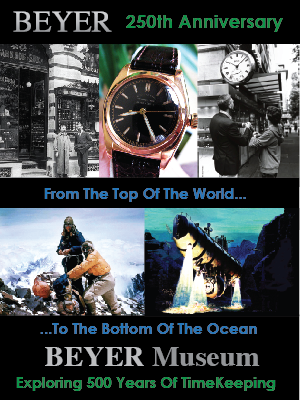 The section above tells the story of Rolex's conquest of the ocean, which is just one small part of their amazing history of making tool watches that have deeply inspired and allowed many explorers to push the limits of what was previously thought to be possible. 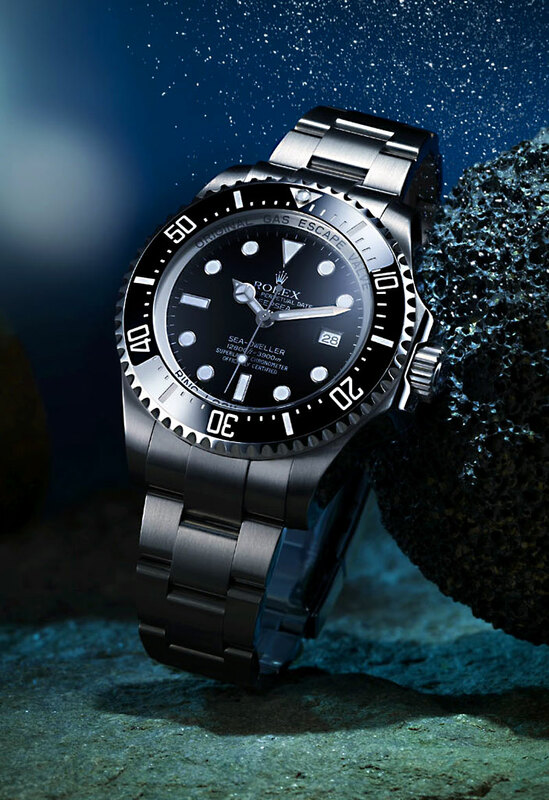 This story I just shared about how Rolex conquered the Ocean and Deep Sea really speaks volumes about their technological and manufacturing prowess. 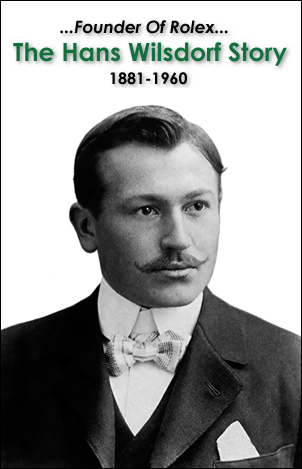 There are many other amazing stories, and you can find them in the Library of RolexMagazine.com, but I though I would share this one to offer broad context for the unparalleled heritage of Rolex. • Part 5: Jacques-Yves Cousteau: From Submariner to SEA-DWELLER. 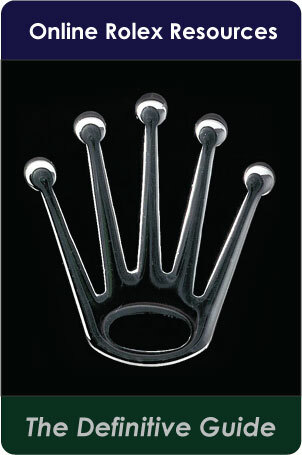 Operation Conshelf to Operation Tektite, to The COMEX Rolex.